Ask people what they know about the Big Sky State and almost everyone will tell you it’s the unofficial capital of fly fishing. And yet most know so little about the history of Montana fly fishing. How did it all begin? What were the major changes throughout the years? What should we look forward to? We strongly believe that we cannot create a better future for this wonderful sport unless we understand its past. Before we dig too far into Montana fly fishing history, let’s see how the entire nation got to know about this type of fishing. Fly fishing was introduced to the US by Europeans in the late 19th century. It was considered an innovative way to catch fish back then and it was mostly used for bass. It took a couple of decades for fly fishing to gain popularity. Luckily, around the same period (1883), the brown trout was introduced to American waters. The east coast and the Midwest were the first two areas to take fly fishing seriously. In the early 1920s, fly fishing had already become a “thing”, an established way to catch fish. Fly fishing contests were also starting to become popular. At the time, people had much less sophisticated gear. Bamboo rods, brass reels and lines made of horsehair were the norm. It didn’t take long for Montana to start enjoying popularity among fly fishing enthusiasts. This happened in the 1930s. Soon after that, game-changing developments happened. As early as the 1950s, fly fishermen came up with ways to perfect their favorite techniques. Monofilament leaders, rods made of fiberglass and synthetic line started to be adopted on a large scale. During the same decade, one of the fly fishing pioneers and heroes made history. Dan Bailey, the owner of a fly shop since 1938, helped saved the Yellowstone river from getting a dam. This is the title of the book and the movie that changed the history of Montana fly fishing forever. Until the late 1970s, Montana residents were avid anglers, but the fame of the Big Sky State Rivers hadn’t gotten too far. In 1976, the book was published and had moderate success, which started bringing some tourists to Montana. However, in 1992, the movie starring Brad Pitt was launched. This was the real cornerstone and, perhaps one of the things that established Montana as the premier US destination for fly fishing. Soon after the movie was released, Montana saw a 120% increase in tourists and out-of-state anglers. This is also what helped get women interested in fly fishing. Most importantly, the Blackfoot River’s conservation began. The Montana fly fishing industry has never been so booming. Following the release of A River Runs Through It, countless fly fishing businesses have emerged and they continue to do so. It may have been a movie that put Montana on the map, but its residents knew how to keep the flame burning for 25 years and counting. Today, Montana is home to the Fly Fishers International Association and hosts a wide array of events dedicated to this wonderful sport. 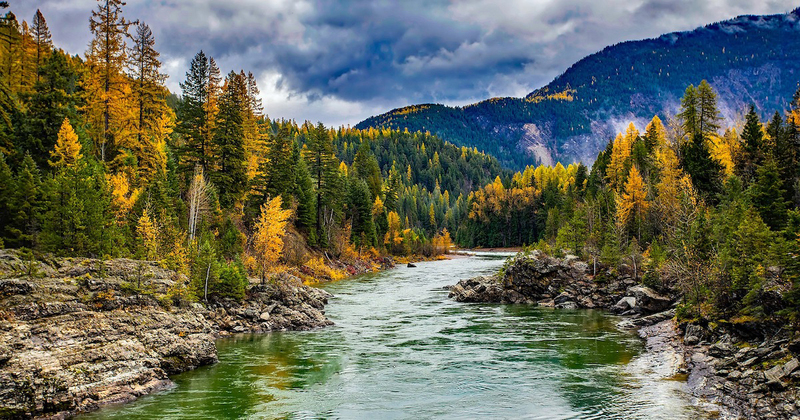 Even more, with the help of organizations like Trout Unlimited, we have managed not just to keep Montana on the map for anglers everywhere, but to conserve its waters and its natural beauties. 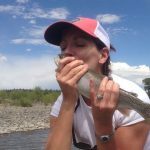 The Montana Department of Fish, Wildlife and Parks maintains a strict policy of fly fishing seasons and enforces various rules that help preserve the waters and the fish of our state. More and more anglers have understood the importance of conserving our waters and their “inhabitants”, so catch-and-release has become the norm for the majority of us. We love to see that Millennials are also very interested in the history of Montana fly fishing. We are proud to pass the torch on to such a wonderful generation and certain that they will be even more responsible about our waters than we were in our youth.